Thruout the winter, nite temperatures in the mudroom stayed consistently about 10° F (5.6° C) above the outdoor temperatures. Daytime temperatures in the mudroom would often get warmer than the outdoors by more than 10° F, especially on clear days with the sun shining thru the south-facing window. The effect has been what I wanted: the trees in the mudroom have had a milder winter than their hardy counterparts outside. And now they are having an earlier spring: as I write, all but the bald cypress have broken dormancy. Half a dozen of them were due for repotting this year, and I spent some very enjoyable hours this past weekend doing just that. (Outdoors, too! ☺) Here's a picture of the weekend's haul. Repotted on March 10 and 11. From left to right, in back: Japanese maple (Acer palmatum,) hedge maple (Acer campestre,) and Japanese black pine (Pinus thunbergii;) in front, two trident maples (Acer burgerianum) that are probably 4 years old, and a trident maple rooted cutting (small green pot) from last fall. 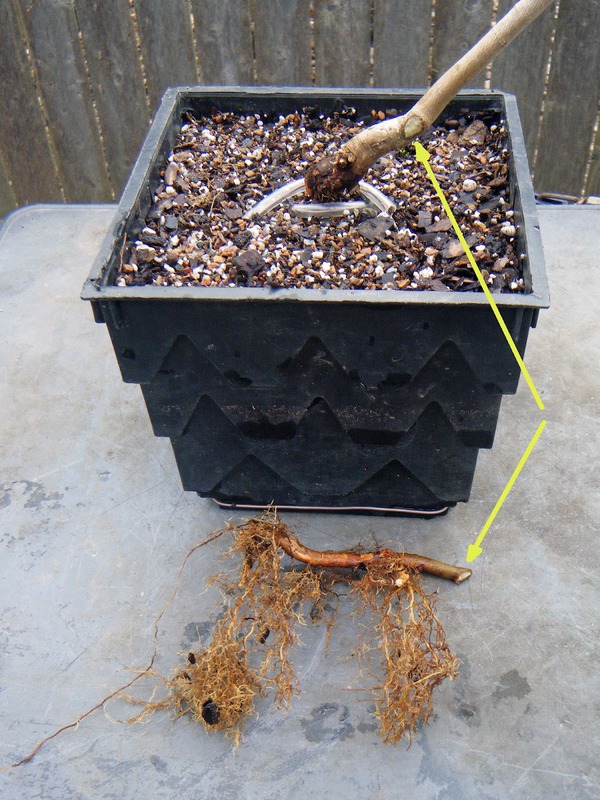 The cutting is my first success at rooting trident maple. 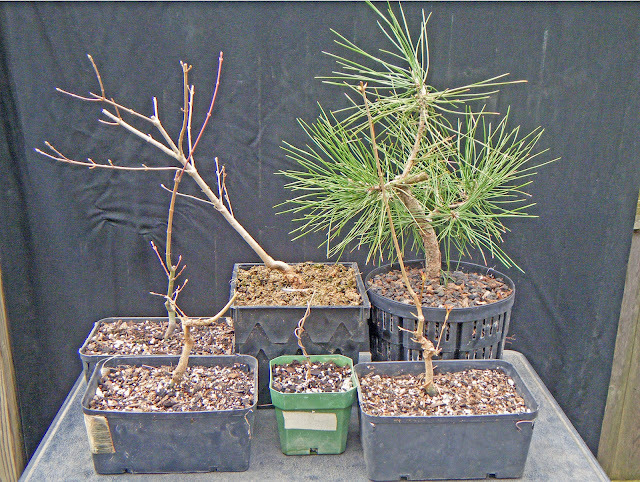 All these trees are still in development, and all were potted on -- i.e., potted into containers a little larger than they had been in before. All the maples are potted in what I call "goulash:" a general blend of bark, Turface, granite grit, and some perlite; proportions are judged by eye, and most of the ingredients are recycled, after first being re-sifted to remove fine particles. The pine is in a more exact mix of scoria (usually sold as "lava,") bark, and Turface, in proportions of 5:3:2. New root tips on the Japanese black pine. 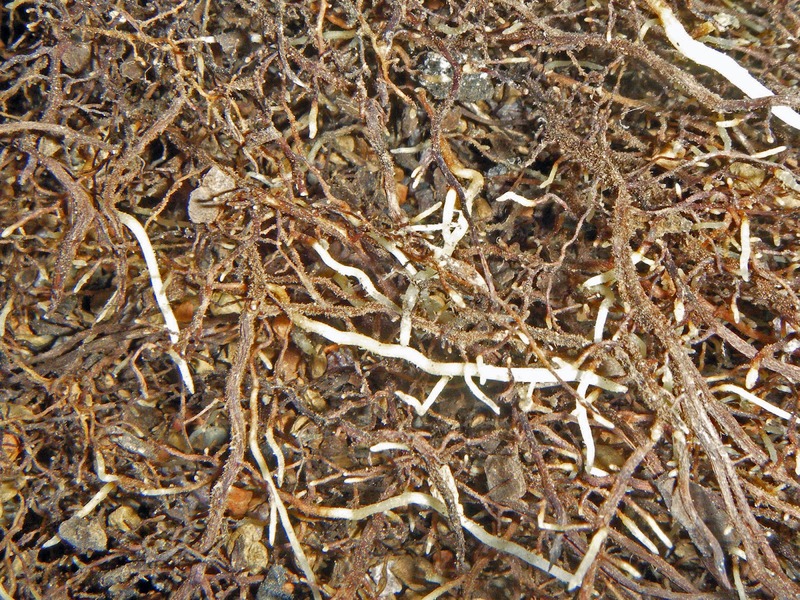 I was particularly pleased when I cleaned the pine's roots and found plenty of new white root tips. That meant the tree was at just the right point for repotting. (I'm still learning about pines.) It also led to a little exchange with my wife, which some of you may have seen on FaceBook. 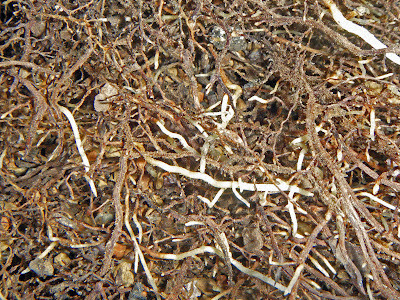 Me: "There were lots of new white root tips. It was beautiful!" She (after a half-second pause): "Um, OK."
Me (laughing): "Well, beautiful to a bonsaiist!" Arrows: the root's upper end, and where it was cut from. The hedge maple gave me an unexpected little bonus. 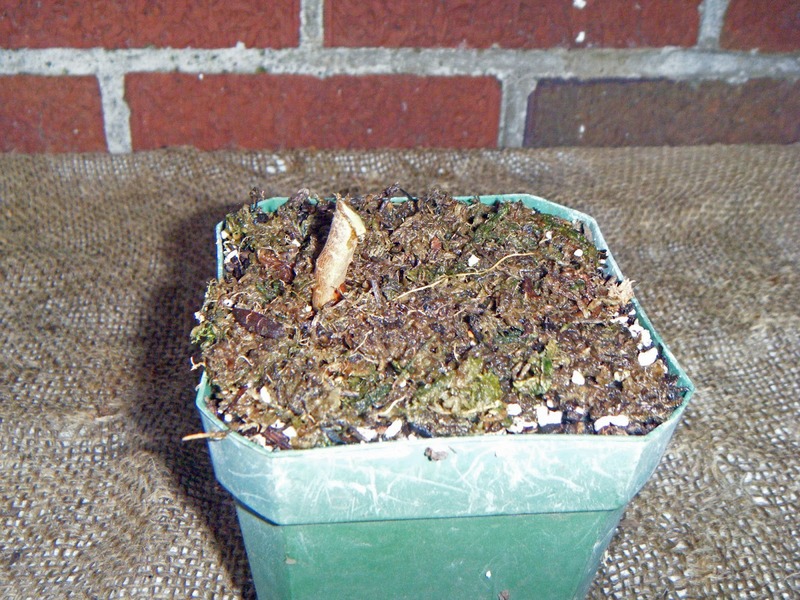 When I bought the tree last summer, it had a large root that emerged from the trunk about an inch above the soil line and angled off a bit before entering the soil. This created a gap like a narrow "A" in the tree's base, as seen from two sides. I wasn't sure what I was going to do with that root. 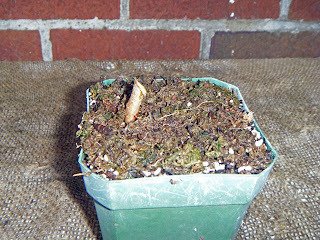 But after cleaning the root system, I decided that the maple could afford to live without it. I snipped it off and had a root cutting. After smearing cut paste on the above-ground cut end, I potted it up with about as much of its length showing above the soil as had been showing before. It's now in the warmth and humidity of the Crate. If all goes well, in a few years I'll have another hedge maple ready to style! 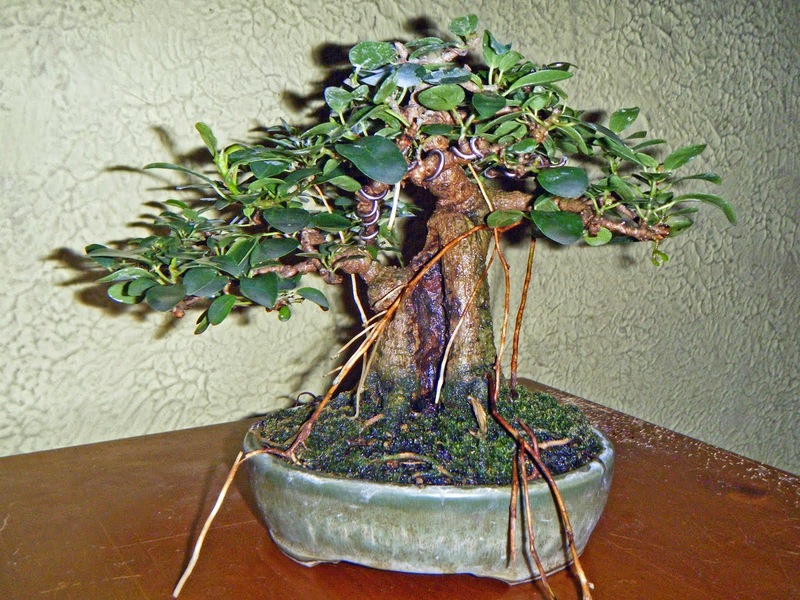 I had a hedge maple a few years ago, that another club member had grown from a root cutting. To my regret, I sold it; but now I have the chance to get another hedge maple, and it's just a bonus that the method is the same.